Golems, Zombies, Tentacled Creatures, lend me your half-eaten Pinna! I’m currently doing my PhD dissertation @ University of Missouri, Rolla in Systems Engineering. The problem area that I plan on tackling is in Product Development, Conceptual Engineering, and technology readiness level (TRL) 0-4. My proposed title is “Fostering Innovation Utilizing Computational Intelligence in Large Systems and System of Systems Architectures“. Here’s a copy of the Program_Study, with selected data scrubbed (my name, phone number, ID, school e-mail, and adviser’s name) for apparent reasons. So my aim in utilizing this blog is to document my research as I go. It is with the hopes that as long as I keep documenting knowledge that I discover, which might or might not be pertinent to the topic itself, that hypothetically . . . the dissertation should be able to write itself in the end. The rule I’ve set for myself is pretty simple. Everything should be captured and documented, that way I maintain complete transparency about where I got my data, my interpretation (right or wrong), and be open to feedback. Needless to say I’ve already started doing my research and realized that I needed a much better documentation and knowledge management tool, ergo my buddy who runs the Heterodoxia blog, recommended that I use blogging as a means to achieve what I need. Complete transparency plus the ability for the audience to provide feedback, comment, critiques, and so forth. My thoughts will be all over the map as I research different areas that will bolster the original proposed dissertation topic. 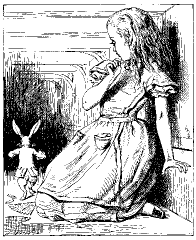 Bear with me as I go down the rabbit hole, devoid of psychotropics, holotropic breathwork, or sensor deprivation.